Any departure from the following should be considered a fault, and the seriousness with which the fault should be regarded should be in exact proportion to its degree and its effect upon the health and welfare of the dog and on the dogs ability to perform its traditional work as a gundog. Please Note: For Conformation exhibition purposes only, the solid-colored dogs and multi-colored dogs are shown separately. They are not actually separate breeds. Dogs similar in type to todays Poodle were carved in Roman tombs as far back as 30 A.D. and can be seen in European paintings as early as the 15th century. Although the breed took its name from the German word pudel, which means to splash in water, the French were responsible for bringing the Poodle to international attention. The first Poodles in England were known as Rough Water Dogs and they served primarily as hunting companions. Poodles were first brought to the United States at the end of the 19th century, but the breed did not become popular until after World War II. By the mid 50s, the Poodle was the most popular breed in the United States, a position held for over 20 years. Today the Poodle is divided into two breeds: the Standard Poodle, which serves primarily as a gun dog and companion animal, and the Poodle, composed of the Miniature and Toy varieties, and which serves primarily as companion breed. The standards of the two breeds are essentially identical but for size. 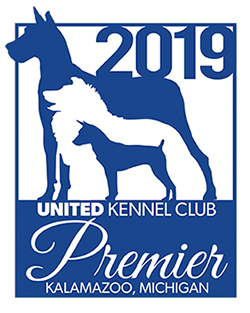 The Poodle was recognized by United Kennel Club in 1914. 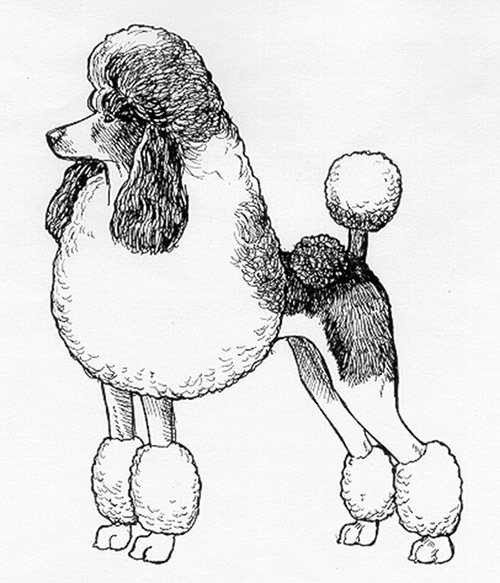 The Poodle was divided into two breeds, Standard Poodle and Poodle, on January 1, 2000. The standards for the Multi-Colored Standard Poodle and the Standard Poodle are identical except for color and color patterns. The Multi-Colored Standard Poodle is a medium-sized, squarely built dog with a distinctive harsh curly coat that may be presented in any of several traditional Poodle clips or corded. The ears are long, drop, and densely feathered. The tail is normally docked, set high, and carried erect. The length of body (sternum to point of buttocks) is equal to the height (withers to ground). The Multi-Colored Standard Poodle carries himself with an air of dignity and pride. The Multi-Colored Standard Poodle should be evaluated as a working gun dog and exaggerations or faults should be penalized in proportion to how much they interfere with the dogs ability to work. The Multi-Colored Standard Poodles most readily identifiable characteristic is its harsh, dense coat, which is presented in various traditional trims or, less frequently, corded. Another essential characteristic is proper temperament. The breed is noted for its high intelligence, trainability and sense of humor. Poodles are highly social and require human companionship and regular, close interaction with family members. Because of their great intelligence and the joy they take in human companionship, Poodles excel in performance events of all sorts. They are extremely affectionate with children. The head is proportionate to the size of the dog. When viewed from the side, the skull and muzzle are roughly parallel to one another and joined by a slight but definite stop. The skull is long and moderately rounded on top. Cheeks are clean and flat. In profile, the muzzle is straight and roughly equal in length to the length of the skull, measured from stop to occiput. The muzzle is fine with a slight chiseling under the eyes but with sufficient depth of underjaw to prevent snipiness. Lips are tight with black or liver pigment appropriate to coat color. Serious Faults: Lip pigment incomplete or of wrong color for color of coat; weak underjaw. The Multi-Colored Standard Poodle has a complete set of evenly spaced, white teeth meeting in a scissors bite. Serious Faults: Overshot, undershot, wry mouth. Nose leather is liver for dogs with brown or caf-au-lait coat color. Dogs with coats of all other colors must have black pigment, except that dogs with apricot coats may have liver nose pigment but it is not preferred. Serious Faults: Nose pigment incomplete or of wrong color for color of coat. Eyes are oval in shape and set sufficiently wide apart to give an alert, intelligent expression. Eyes are dark brown in dogs with black pigment, and range from dark brown to dark amber for dogs with liver pigment. Serious Faults: Round, protruding, large or very light eyes; eye and eye rim colors wrong for color of coat; eye rim pigment incomplete. Ears are drop with long, wide, densely-feathered ear leather. Ears are set at or slightly below eye level and hang close to the head. Fault: Excessively long ear fringe. Disqualifications: Blue eyes, or any variation of, including flecks and marbling. The neck is of sufficient length and strength to permit the head to be carried high when standing or moving. The neck blends smoothly into well-laid-back shoulders. The skin on the neck and throat is tight. Shoulders are smoothly muscled. The shoulder blades are long and well laid back. The upper arm appears to be equal in length to that of the shoulder blade and joins it at an apparent right angle. Elbows are close to the body. The forelegs are straight with bone and muscle proportionate to the size of the dog. Pasterns are strong and slightly sloping. Viewed from the front, the forelegs are parallel. Viewed from the side, the point of elbow is directly below the withers. A properly proportioned Multi-Colored Standard Poodle is square, with the length of body (measured from prosternum to point of buttocks) equal to height (measured from the withers to the ground). The length of the front leg (measured from point of elbow to the ground) is just slightly longer than half the dogs height. The line of the back drops off almost imperceptibly behind the withers and is then level. The loin is short, broad and muscular with moderate tuck-up. The ribs extend well back and are well sprung out from the spine, then curving down and inward to form a deep body. The brisket extends to the elbow. Viewed from the front, the chest is well filled and moderately wide. Hindquarters are muscular and with broad second thighs. The angulation of the hindquarters is in balance with the angulation of the forequarters. The stifles are well bent and the hocks are well let down. When the dog is standing, the short, strong rear pasterns are perpendicular to the ground and, viewed from the rear, parallel to each other. In profile, the croup is nearly flat. Good feet are essential for a working gun dog. The feet are relatively small, oval in shape and compact with well-arched toes and thick, elastic pads. Feet do not turn in or out. Nails are short and dark or self-colored, depending on coat color. Dewclaws on forelegs may be removed. Removal of rear dewclaws is preferred but not mandatory. Serious Faults: Thin pads, splay foot. The tail is straight, set high, and customarily docked to a length proportionate to the size of the dog. Whether standing or moving, the tail is carried erect. Serious Faults: Low tail set, tail curled or carried over the back. The Multi-Colored Standard Poodle has harsh, dense, curly coat. For conformation exhibition, the coat may be presented naturally, corded, or in one of the traditional clips described below. Quality is never to be sacrificed in favor of the type of clip in which a dog is presented. The cords are tight and of even diameter but varying lengths. Cords may be longer on the mane, body coat, head and ears; shorter on puffs, bracelets and pompons. In all of the traditional clips described below, the hair on the topskull may be left free or held in place by elastic bands, which may not be used elsewhere in the coat. Puppy: The coat is long with the face, throat, feet and base of the tail shaved. A pompon shall be left on the end of the tail. The coat may be shaped to give a neat appearance. English Saddle: The face, throat, feet, forelegs and base of tail are shaved, leaving puffs on the forelegs and a pompon on end of the tail. The hindquarters are covered with a short blanket of hair except for a curved shaved area on each flank. Each rear leg is circled by two shaved bands, one just above the stifle and one just above the hock joint. The rest of the body is left in full coat but may be shaped for balance. Continental: Face, throat, feet and base of tail are shaved. Hindquarters are shaved with pompons on the hips optional. There is a pompon on the end of the tail. Legs are shaved leaving bracelets on the rear legs and puffs on the forelegs. A portion of the foreleg is shaved above the puff. The rest of the body is left in full coat but may be shaped for balance. Sporting: Face, feet, throat and base of tail are shaved. There is a pompon on the end of the tail. Coat on the top of the head is scissored into a cap. The rest of the body and legs are trimmed following the outline of the dog. The body coat shall be no longer than 1 inch in length. Leg hair may be slightly longer. Coat colors in Multi-Colored Poodles include the following: Apricot, black, blue, cream, gray, silver, white, red, silver beige and all shades of brown, including caf-au-lait. Dogs whose coats include the brown shades may have dark amber eyes; liver noses, eye rims and lips; and dark nails. Dogs with apricot coat color may have this combination of eye, pigment and nail color as well but it is not desirable. All others must have very dark eyes; black noses, eye rims and lips; and black or self-colored nails. At least fifty percent white, with spots or patches of any other acceptable solid color. The head can be of a solid color but white muzzle, blaze, or white muzzle/blaze combination (preferably symmetrical) is equally acceptable. Full or partial saddles are acceptable, as long as they do not exceed the color proportion, but are not preferred. Ticking in the white of the coat is acceptable but not preferred. Solid base color with sharply defined markings of a second color appearing above each eye, on the sides of the muzzle, on the throat and forechest, or in a chin and forechest bowtie pattern as well as on all four legs and feet, and below the tail. A phantom without clearly defined face markings or one that presents with its whole face colored in the second color is acceptable, as long as it maintains all the other specified body markings. Any combination of acceptable colors is allowed. Less than fifty percent white, with the remaining percent any other acceptable solid color. Sable A coat represented by black-tipped hairs on a background of any solid color, with no particular pattern/location designated for such hairs. A solid color base with a striped pattern at the skin. A longer coat may appear blended, but the shaven areas, such as face, feet and base of tail should have distinct stripes. Striping may fade with age due to progressive graying. Disqualification: Any color or color pattern other than described above. Merle coloring. Albinism. Over 15 inches, measured at the withers. Eliminating Fault: 15 inches or under in height. When trotting, the gait is effortless, smooth, powerful and well coordinated, showing good reach in front and drive behind. Action is light and springy with head and tail carried up. Poor movement should be penalized to the degree that it reduces the Multi-Colored Standard Poodles ability to perform the tasks it was bred to do. 15 inches or under in height. Any color other than described above. Blue eyes, or any variation of, including flecks and marbling.